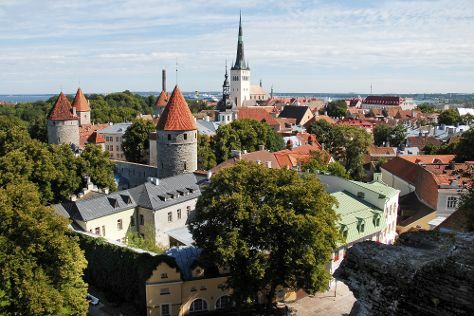 A historic city with its eye firmly on the future, Tallinn blends medieval fortifications, gleaming skyscrapers, and charming boutiques with a spattering of Soviet relics. Popular historic sites such as Toompea Hill and Alexander Nevsky Cathedral are in your itinerary. Get some cultural insight at Tallinn Old Town and Town Hall Pharmacy. There's still lots to do: examine the collection at Lennusadam Seaplane Harbour, explore the world behind art at Kadriorg Palace, contemplate the long history of Convent of St. Bridget (Pirita Klooster), and make a trip to Long Street (Pikk tanav). To find where to stay, other places to visit, more things to do, and tourist information, refer to the Tallinn online travel route builder . If you are flying in from Germany, the closest major airport is Lennart Meri Tallinn Airport. In April, plan for daily highs up to 9°C, and evening lows to 0°C. Finish up your sightseeing early on the 21st (Sun) so you can travel back home.